I first met Julia a little over two years ago when I invited her to participate in my debut solo show, “Beautiful Dreamers,” a series of portrait paintings celebrating 16 women who make Pittsburgh a truly extraordinary city. Meeting Julia on the afternoon of our photo shoot for that show was a transformative experience for me—not only is Julia a wonderful person, but her dedication to her art form inspired me to approach my painting with the same commitment and passion that she brings to ballet. As a portrait painter, I have always been intrigued by the concept of a ‘serial portrait,’ or a series of portraits all about a single subject. Andrew Wyeth has, perhaps, the most famous ‘serial portrait’ in his Helga series, and Alex Katz created a similar project through his lifelong dedication to painting his wife, Ada. I became interested in how the cumulative effect of a serial portrait can convey a greater understanding of an individual than a single image or moment. Once I met Julia, I realized I would be honored to attempt a serial portrait of such an amazing woman. As I progressed in the initial research for this project, my inspiration became less of Andrew Wyeth and more of his son, James Wyeth, who created his own series of paintings and drawings about the dancer Nureyev. The paintings in this exhibition took me 6 months to complete. In addition to meeting with Julia for photo shoots in my home/studio, I was also able to visit Pittsburgh Ballet Theatre’s rehearsal for Giselle where I sketched Julia, and was graciously invited by Pittsburgh Ballet Theater for a photo shoot at PBT’s studio to use actual costumes from performances, which are works of art themselves. I also am a PBT season ticket holder, so I’ve been able to enjoy Julia’s performances throughout the past ballet season. After I’d invited Julia to come to my house for the first photo shoot, but before I’d met her in person, I read an article she’d written in Dance Magazine called “Why I Dance.” In the article, Julia poses a question that all artists grapple with at some point: is an artist’s dedication to art “worthwhile” in a world beset by social and economic ills? Julia answers this question: “But the practice of a privileged art does not imply a lack of virtue or humanity. 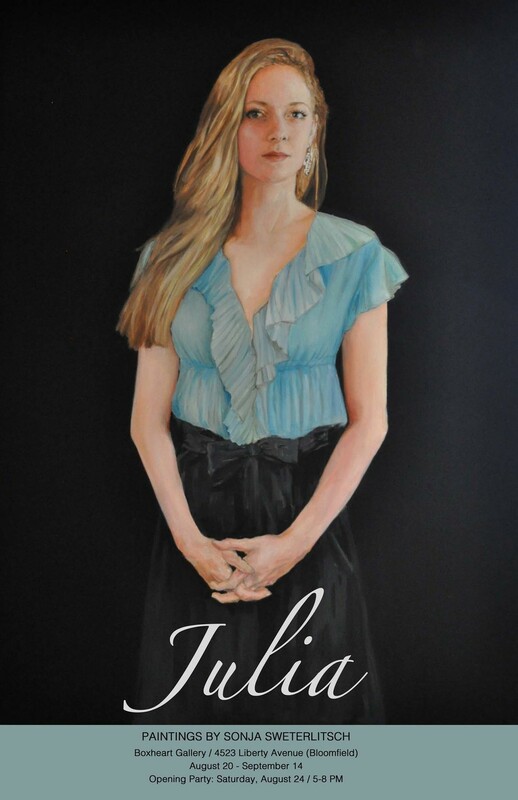 Rather, even with the pressing problems in today’s world, to deny art’s place is to deny humanity.” I find her answer elegant and inspiring, and hope that my paintings of her are able to communicate the beauty Julia lives and creates through her life and art.